UK manufactured sid signs; made in Hampshire. When looking for a speed indication system a UK made product can often deliver a better quality solution at a more affordable price. Traditionally the sid industry has been dominated by electronic companies not sign manufacturers. This has led to many similarities in product design and an approach which seeks to simply enclose a collection of electronic components in a convenient, inexpensive, off the shelf container. 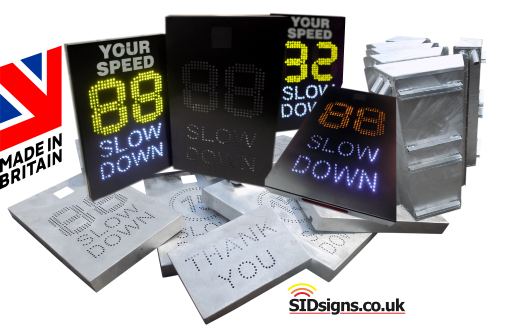 The most suitable material for any sid sign system is aluminium, the only speed sign brand manufactured entirely from this lightweight alloy is a British one. Why would you pay more for a cheap mild steel case or a plastic box imported from abroad? Aluminium is the most durable material to use combining the lightweight characteristics of plastic with the strength and reliability of metal. Only a proper sign manufacturer can give you the fully welded all aluminium construction offered here. Visit our factory and you will find all the plant and machinery needed to design, manufacture and test sid sign systems under one roof. If you want something tailored to suit your specific needs then we'll simply make it; from special mounting brackets through to individual messages and special sizes.